After numerous request from our fans, DDRD is proud to announce that this Saturday’s Championship bout will have a Beer Garden available to all 21+ aged fans!! This is another positive change for our league and proof of DDRD’s commitment to our fans. 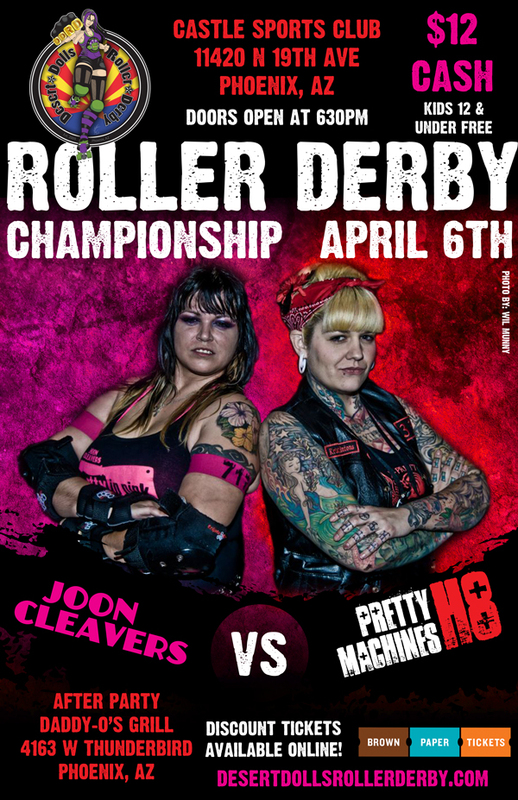 So buy your bout tickets online today and come out to enjoy this high-energy championship and some cold brews, as the Pretty H8 Machines take on the Joon Cleavers! Cash only! Please consume responsibly! Help make this bout an amazing night to remember! Derby Girls Give Back to the Valley! Phoenix – Roller Derby is no longer just about quirky names, fishnets and tattoos. Since it’s inception in 2009, Desert Dolls Roller Derby has always been dedicated to giving back to the community that embraces and supports them. Every season, the Dolls host fundraising bouts for a specific local non-profit. Desert Dolls have raised over $10,000 in an effort to support such causes as Kids Need to Read, Arizona Desert Dogs Rescue, Southwest Autism Research and Resource Center and the American Suicide Prevention Foundation. Desert Dolls Roller Derby knows it can do more to support Arizona and the Valley. In addition to the bi-annual fundraising bouts, each of the four teams that make up Desert Dolls Roller Derby (Cosmic Killas, Joon Cleavers, Pretty H8 Machines and Shotgun Shirleys) will give a portion of monthly team funds to a local non-profit. The Dolls are excited about this new opportunity to reach out to more local non-profits and look forward to the continued support of their fans. Established in 2009, Desert Dolls Roller Derby is one of the newest leagues in the Valley. DDRD is made up of teachers, librarians, law enforcement officers and mothers, all of whom are committed to being an all-inclusive and community oriented league. We believe that any woman, no matter her physical prowess, can be a derby girl. What started out as a small group of friends has grown into a league of over 100 strong, independent women all with the same goal in mind: to provide family-friendly entertainment through one of the fastest growing sports in the country. The Desert Dolls Roller Derby hosts fundraiser. 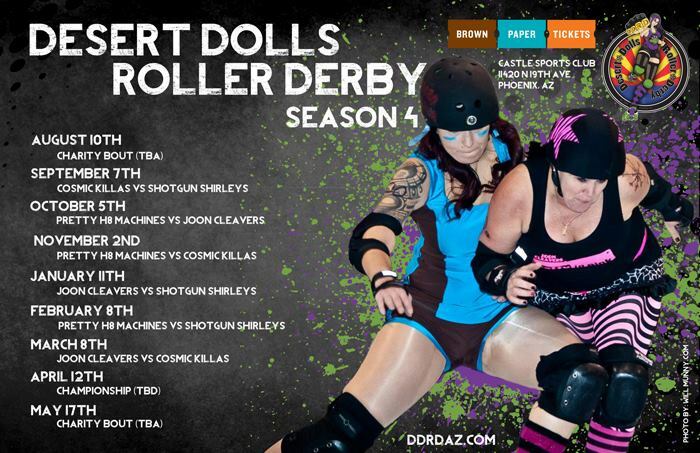 WHAT: Desert Dolls Roller Derby kicks off season 3 by hosting a sizzling fundraising bout. In this Fire vs Ice themed bout, the Dolls will don fishnets and skates to raise money and awareness for Southwest Autism Research & Resource Center (SARRC). Established in 1997, SARRC is a Phoenix based non-profit dedicated to providing support for Valley families and individuals with autism. Any attendee who donates $50 or more at the bout will be entered for a chance to win a pair of season passes for the 2012-2013 season. Doors open at 6:30 p.m.; bout starts at 7 p.m. Kids ages 12 and under are free. All ages are welcome to this fun, family-centric event. Established in 2009, Desert Dolls Roller Derby is one of the newest leagues in the Valley. DDRD is made up of every day heroes; teachers, librarians, firefighters and mothers, all of whom are committed to being an all-inclusive and community oriented league. We believe that any woman, no matter her physical prowess, can be a derby girl. What started out as a small group of friends has grown into a league of over 100 strong, independent women all with the same goal in mind: to provide family-friendly entertainment through one of the fastest growing sports in the country. Desert Dolls Roller Derby hosts fundraiser. WHAT:	Desert Dolls Roller Derby, the premiere all female roller derby league in phoenix, is partnering with Samurai Comics to host a fundraiser to fight illiteracy and inspire a culture of reading for children. The Desert Dolls will don their fishnets to raise funds that will support Kids Need to Read, a Mesa-based non-profit organization that provides books to underfunded schools in the Valley and the nation. This fundraiser will also help fund some literacy programs that help improve kids’ reading skills and comprehension. This evening’s fundraiser theme is “Heroes v. Villains” and spectators are encouraged to dress as their favorite super hero or villain! About Desert Dolls Roller Derby: Established in 2009, Desert Dolls Roller Derby is one of the newest leagues in the Valley. DDRD is made up of every day heroes; teachers, librarians, firefighters and mothers, all of whom are committed to being an all-inclusive and community oriented league. We believe that any woman, no matter her physical prowess, can be a derby girl. What started out as a small group of friends has grown into a league of over 100 strong, independent women all with the same goal in mind: to provide family-friendly entertainment through one of the fastest growing sports in the country.